In case you missed it, this column debuted last week with a look back at sales data and advertising expenditures in 1991. This week, I’ve put together some beer and spirit market comparisons between 1996 and today. Data from 1996 comes from the 1997 Jobson Liquor, Wine and Beer handbooks. More current data is sourced from their current incarnation, the Beverage Information & Insight Group’s Liquor, Wine and Beer handbooks. For more beverage industry data and analysis, visit www.albevresearch.com. Fun fact: for a few years in the mid-90s, this magazine was called Beverage & Food Dynamics and was also distributed to grocery store operators. 1996 was the first year we awarded a single retailer the “Retailer of the Year” award. Charles Bailes III from ABC in Florida won the first year and was pictured on the cover. 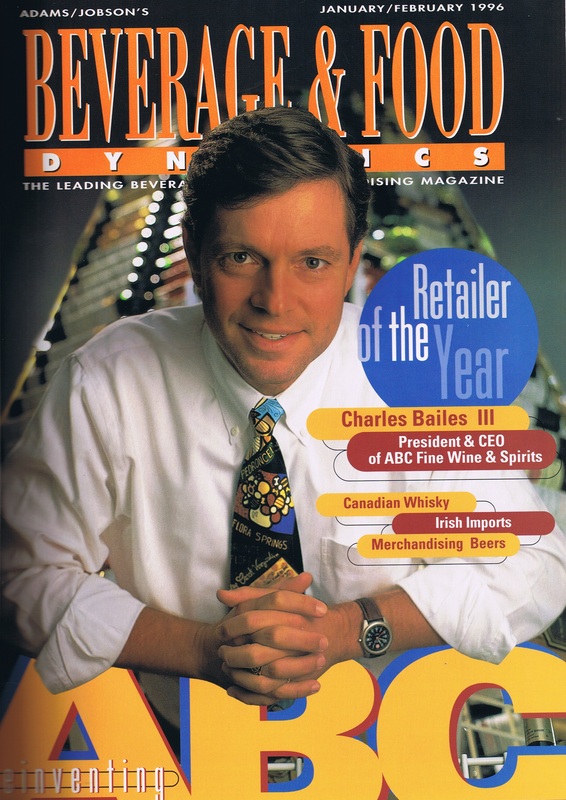 Prior to 1996, Beverage Dynamics recognized the Top Ten retailers in the country. In 2016, we recognized two retailers – Cork Liquors and Half Time Beverage – for the first time, and in 2017 we’ll expand the list once again. 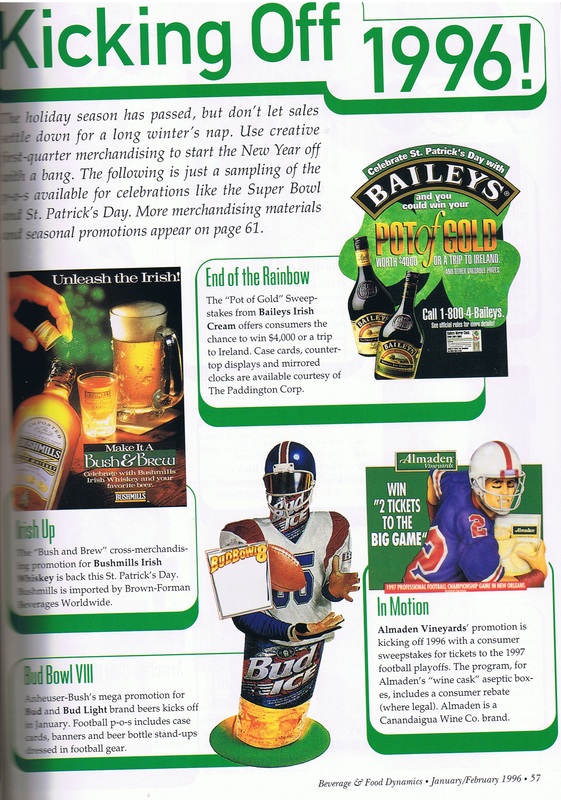 The January/February 1996 issue also contained a merchandising guide for the first quarter, including suggestions for Super Bowl and St. Patrick’s Day promotions. The text from the images to the left is transcribed below, followed by statistics showing how some of the featured brands’ sales have changed over two decades. Page 1 of a first quarter merchandising guide in 1996. The holiday season has passed, but don’t let sales settle down for a long winter’s nap. Use creative first-quarter merchandising to start the New Year off with a bang. The following is just a sampling of the p-o-s available for celebrations like the Super Bowl and St. Patrick’s Day. End of the Rainbow (Baileys): The “Pot of Gold” sweepstakes from Baileys Irish cream offers consumers the chance to win $4,000 or a trip to Ireland. Case cards, counter-top displays and mirrored clocks are available courtesy of The Paddington Corp.
Irish Up (Bushmills): The “Bush and Brew” cross-merchandising promotion for Bushmills Irish Whiskey is back this St. Patrick’s Day. Bushmills is imported by Brown-Forman Beverages Worldwide. In Motion (Almaden Vineyards): Almaden Vineyards’ promotion is kicking off 1996 with a consumer sweepstakes for tickets to the 1997 football playoffs. The program, for Almaden’s “wine cask” aseptic boxes, includes a consumer rebate (where legal). Almaden is a Canandaigua Wine Co. brand. Bud Bowl VIII (Bud Ice): Anheuser-Busch’s mega promotion for Bud and Bud light brand beers kicks off in January. Football p-o-s includes case cards, banners and beer bottle stand-ups dressed in football gear. St. Patrick’s Rocks (St. Brendan’s Irish Cream): St. Patrick’s Day party favors from St. Brendan’s Irish Cream include derby-style hats, buttons, T-shirts and other items with the “Shamrock ‘N Roll” slogal. St. Brendan’s is marketed by the David Sherman Corporation. Page 2 of the first quarter merchandising guide from 1996. 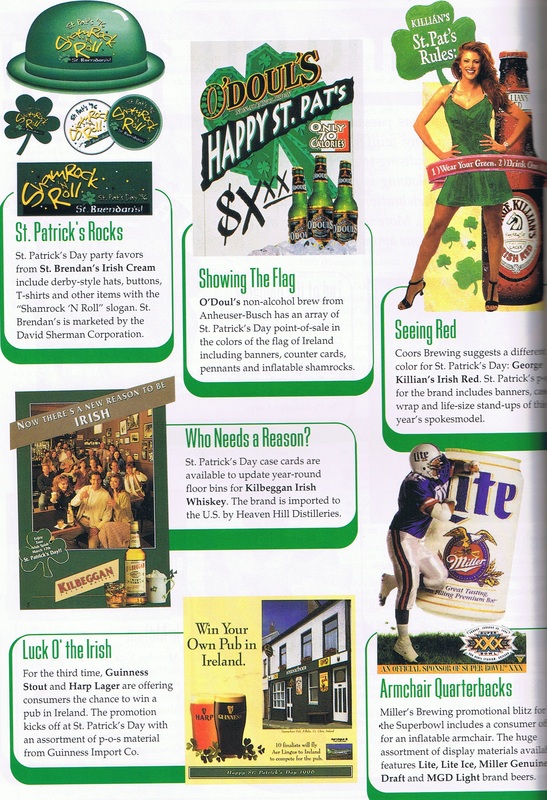 Showing the Flag (O’Doul’s): O’Doul’s non-alcohol brew from Anheuser-Busch has an array of St. Patrick’s Day point-of-sale in the colors of the flag of Ireland including banners, counter cards, pennants and inflatable shamrocks. Seeing Red (Killian’s): Coors Brewing suggests a different color for St. Patrick’s Day: George Killian’s Irish Red. St. Patrick’s p-o-s for the brand includes banners, case wrap and life-size stand-ups of the year’s spokesmodel. Who Needs a Reason (Kilbeggan): St. Patrick’s Day case cards are available to update year-round floor bins for Kilbeggan Irish Whiskey. The brand is imported to the U.S. by Heaven Hill Distilleries. Luck O’ the Irish (Guinness/Harp): For the third time, Guinness Stout and Harp lager are offering consumers the chance to win a pub in Ireland. The promotion kicks off at St. Patrick’s Day with an assortment of p-o-s material from Guinness Import Co.
Armchair Quarterbacks (Miller Lite): Miller’s Brewing promotional blitz for the Superbowl includes a consumer offer for an inflatable armchair. The huge assortment of display materials available features Lite, Lite Ice, Miller Genuine Draft and MGD Light brand beers. Baileys sold 850,000 9-liter cases, giving the brand a 5.3% share of the cordials and liqueurs category. In 2013 (the most recent data available), the brand sold 1.4 million cases, which was an increase of 3.6% over the previous year. Bushmills sold 100,000 cases, representing a 33.9% share of the Irish Whiskey category. In 2014, Bushmills sold 185,000 cases, which was an 11.9% decline from 2013. Kilbeggan Irish Whiskey sold 6,000 cases. Bud Ice sold 26 million 2.25 gallon cases, giving it a 27.3% share of the ice beer category. Miller Lite sold 220 million cases, with a 21.9% share of the light beer market. O’Doul’s managed 11.2 million cases sold, which represented 36.8% share in the non-alcohol beer category. And Killian’s Red sold 8.5 million cases, giving the brand a 7% share of the super-premium beer market. Guinness sold 5.7 million cases in 1996, with a 3.3% share of the imported beer category. In 2014, Guinness sold more than twice that, 12.6 million cases, though that was down 3.5% from 2013. 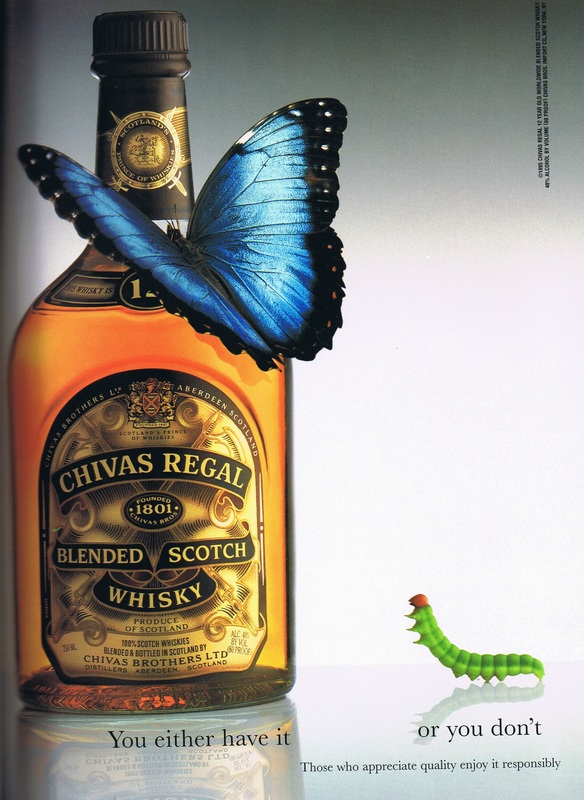 An advertisement for Chivas Regal from the January/February 1996 issue. You either have it or you don’t. Those who appreciate quality enjoy it responsibly. Copyright 1995 Chivas Regal 12 Year Old worldwide blended Scotch whisky. 40% alcohol by volume (80 proof). Chivas Bros. Import Co, New York, NY. If this ad was entered in our Advertising & Promotion Awards today, it would almost certainly win in the full-page trade ad category. The previous year (1995), Chivas Regal sold 560,000 cases, giving the brand a 5.2% share of the Scotch category. In 2014, the brand sold 358,000 cases, which was a 8.7% decline over the prior year. Jeremy Nedelka is the editor of Beverage Dynamics and StateWays magazines. If you have a suggestion for a future Remember Whensday column, email him at jnedelka@epgmediallc.com.